G – ANSI flange, in-line delivery and suction ports, Class 35/40B cast iron. • Innovative axial load compensation system on pumps with higher head. This ensures reduced axial thrusts and enables the use of standard NEMA TC motors that are easily found in the market. 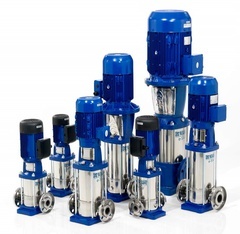 The e-SV range of pumps features 11 models, and can be specially configured for a wider range of applications. The line is interchangeable with Goulds Water Technology Pumps’ SSV series of vertical multi-stage pumps for added flexibility in meeting pumping requirements. Additionally, five e-SV manufacturing facilities around the world provide shorter lead times and faster service. The e-SV’s newly-designed hydraulics, combined with a high-efficiency motor (EISA compliant) deliver maximum efficiency. Pumps are among the largest users of industrial energy. Do your part to reduce CO2 emissions and your impact on the environment -- and improve your bottom line - by taking advantage of the new e-SV’s lower energy requirement. Use a new e-SV pump along with a variable speed drive such as Xylem’s Hydrovar®, and save even more energy and money. The e-SV’s new design allows removal of the mechanical seal without having to remove the motor, reducing repair time by up to 50%. A standard mechanical seal, wearing components, service tools and standard NEMA motors enable faster and easier maintenance and servicing. Available on pumps 10 HP and above, the patented i-ALERTTM monitor continuously measures vibration to support optimum performance. • Standard NEMA TC Frame motors in open drip proof or totally enclosed fan cooled.